ANN ARBOR, Mich. and SAN DIEGO, Calif. — Kashi’s new cereal, Dark Cocoa Karma Shredded Wheat Biscuits, is the first food product to earn QAI Certified Transitional, a new program which recognizes and incentivizes farmers as they transition their land from conventional to organic growing methods. QAI, Inc., a leading certifier of organic food in North America and part of the global public health organization, NSF International, designed the program to verify producers’ ability to meet increasingly rigorous requirements over three years, after which they are eligible to become Certified Organic. Products. These products contain a minimum of 51% transitional content and can display the Certified Transitional mark on packaging, allowing consumers to identify and support companies and farmers during their conversion to organic. Demand for certified organic products has outpaced supply, prompting companies to not fill orders or import foreign organic ingredients to fulfill demand. Additionally, transitioning farm land to organic is costly with limited return on investment since it takes three years to become eligible for organic certification. These barriers have stymied the growth of organic farm acreage, which is only about one percent of U.S. farmland, despite double-digit annual organic revenue growth. QAI’s program helps lower these barriers and facilitates the transition of farmland to organic and allows for premium pricing for the higher value crop allowing consumers to support the conversion of more organic products. No prohibited substances: Sewage sludge, irradiation, GMOs and other National Organic Program prohibited substances are not permitted on certified transitional land or product. Organic training: Producers and manufacturers are required to complete education courses to demonstrate competency in organic regulations. Accountability: Farms and manufacturing facilities are subject to annual inspections and may be selected for unannounced inspections and sampling. Due diligence: Records demonstrating compliance with the applicable elements of organic regulations must be created and maintained from the start of the program including compliance plans, land use, soil fertility, seeds and planting stock, crop rotation, pest/disease control and any inputs or ingredients used. Approved labeling: Depending on percentage of transitional ingredients, products can display certain claims on packaging. Products with at least 51% transitional ingredients can display the Certified Transitional mark on packaging. To gain the Certified Transitional logo for its new cereal, Kashi worked with Hesco/Dakota Organic Products, a specialty grain company, to identify and work with two farmers interested in transitioning new land from conventional to organic farming practices. Dark Cocoa Karma Shredded Wheat Biscuits cereal was, as a result, developed to use 100 percent Certified Transitional wheat. 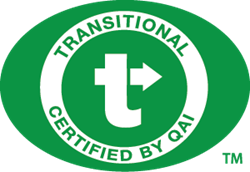 Learn more about QAI Certified Transitional by visiting the QAI website or contacting Nova Sayers at nsayers@nsf.org or +1 (734) 913-5710. Editor’s Note: For media interested in more information or to schedule an interview with a QAI or NSF International expert, please contact Liz Nowland-Margolis at media(at)nsf(dot)org or +1 734-418-6624. About QAI (Quality Assurance International): Founded in 1989, QAI is the leading provider of organic certification services verifying organic integrity throughout the supply chain (qai-inc.com). Additional certification services include transitional, gluten-free, kosher, natural personal care, social responsibility and food safety through its parent company NSF International. QAI remains dedicated to the environment, while providing educational outreach to the organic community, customers and consumers. Headquartered in San Diego, Calif., the company has grown to include operations in the U.S., Canada, Latin America, Japan and the European Union.